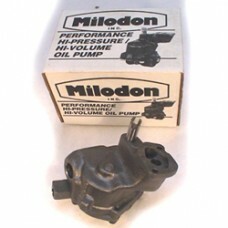 Milodon high volume / high-pressure pump providing a 20% to 30% increase both in volume and pressure. Heavy duty and performance applications require an increase in both areas. Increased bearing loads, increased RPM and horsepower all place greater demand on the oil system, which, if not up to the job, can cause severe engine failure. For SBC but incorporates a 3/4-inch pick-up inlet and is of the Big Block Chevrolet style. Must use matching 3/4-inch pick-up.